February 2, 2019 marks the 30th anniversary of the Montana Rail Link train collision that rocked the community of Helena and Carroll College. The explosion caused by the run-away train cars occurred at 4:48 a.m. sending plumes of ominous black smoke into the sky while scattering train debris across campus. The collision of train cars caused massive damage to the Carroll campus and forced the pre-dawn evacuation of hundreds of students from the dormitories as temperatures dipped to 70-below zero with the wind chill. Thirty years later we are able to reflect back on that day and recount the shared experiences, revisit the physical devastation, express our gratitude to the Helena community and most importantly, be forever thankful that miraculously no one was seriously injured during this truly monumental event. 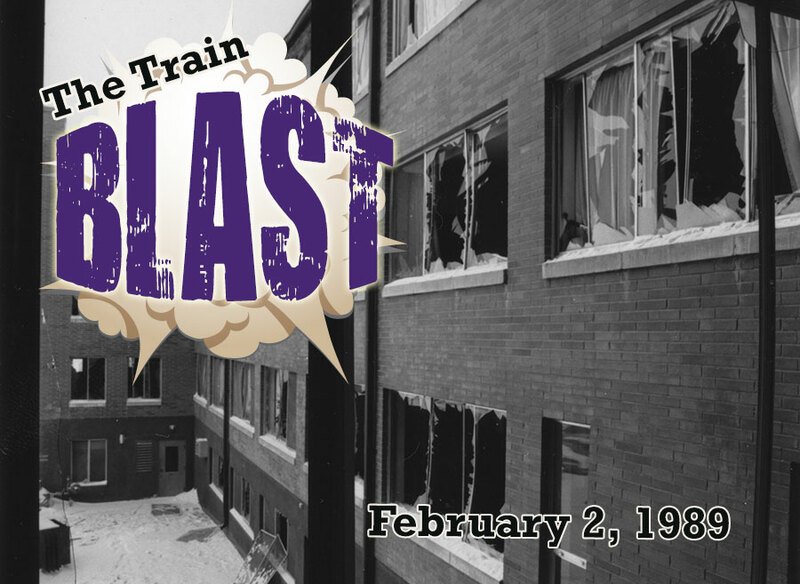 Every five years since 1989, the Helena community and Carroll revisit the February 2 anniversary of “The Blast,” the name that the train explosion became known as. As a storyteller by nature, I enjoy reflecting on the event at each of the anniversaries because the story has a happy ending. An event that caused extensive damage to Carroll did not result in any serious injury to students or members of the community. During the first hours of the event on that frigid morning, that fact wasn’t known. Remembering that time, I can still feel the weight on my chest of fear that someone was hurt or would be hurt. By the end of the day that weight was lifted. This experience reminded me, and often reminds me, that with all the concerns and plans Carroll has, the essential work is educating and taking care of students. All other concerns slip away when that care for students’ safety becomes the only work that matters. The residence halls were linked by an internal phone system that was not tied to the electrical grid, so when the power and all other phones were shut down, I was able to talk to Francee O’Reilly, the resident director of Guad, and learn about the damage to Guad. Within minutes of the event, the RA’s in St. Charles came to my room on 3 rd Main wanting to know what to do. I was able to tell them about the broken windows in Guad and they ran down to help with the evacuation. Emergency personnel came through the dorm saying that the building had to be evacuated because of toxic fumes. A strong odor permeated the air and I realized that even if it was toxic, I had to keep moving providing help and direction as needed. I remember making sure all the student rooms in St. Charles and Borro were locked after everyone evacuated. Another striking image was being in the National Guard Armory and seeing a news report on CNN with a graphic map of Helena and a dark cloud hanging over a spot marked as Carroll College. Only one phone was available for any of us evacuated and I remember standing in line to call my Dad, who I knew would be watching CNN. The only injury to a student occurred when two students, fortified with some beer, decided they’d drive and came down the road between the library and Guad going too fast and slid off the road hitting a tree and causing one of the students to break his arm. Classic college stupidity. The college was evacuated at around 6:30 am and students were taken to different locations. By noon, all students had found a place to stay, either with the Helenans who came by to offer room or with off-campus students. About a week later, all the students came back to get items from rooms. Guad was in great disrepair with broken glass everywhere. Faculty and staff helped everyone gather and move clothing and other items. After the event, I could sense in most people a sense of renewal and of hope from knowing that something disruptive had happened and the Carroll community and the Helena community had responded with love and generosity. Ed Noonan is a current Carroll College adjunct faculty member for film studies and a commissioner for the city of Helena. He formerly served as the Director of Student Activities at Carroll at for many years as well as the Executive Director of the Myrna Loy Center in Helena.